Shortly before nine p. m. last night the citizens were aroused by the alarm of Fire, and thousands of persons were to be seen running from all directions to the Conflagration. 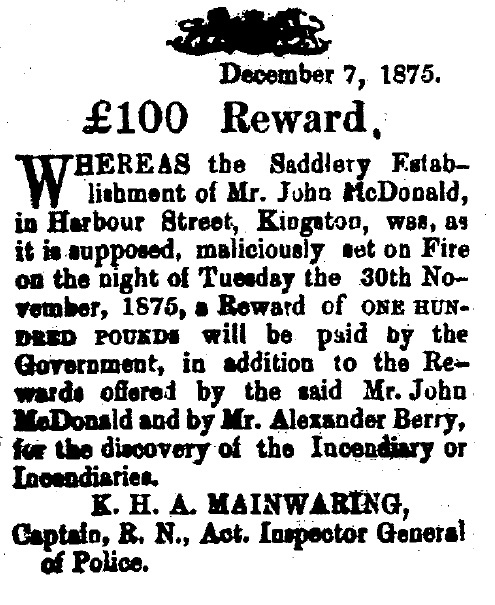 The fire originated in the Store in Harbour Street and Water Lane occupied by John MacDonald, Esq., Saddler, and at the time of the alarm had ordinary aid been rendered the flames could have been easily subdued, and much valuable property saved; but as usual in Kingston, whenever a fire occurs, water is sure to be scarce, and unfortunately in this instance the people remained passive awaiting the action of the Fire Brigade, but alas for the boasted institution of the country -- with a tax of 7d in the pound, disorganization reigned supreme -- and a more worthless ineffective force never existed. But the flames rapidly gained, and in a short time the entire building of J. McDonald was enveloped in flames. The premises occupied by our contemporary, The Morning Journal, for whom we express our earnest sympathy, might have been saved, but the cry for water in Harbour Street was echoed on all sides with answer of none, but one stream of water from a plug in Church Street and Water Lane, was obtained and played upon the fire. 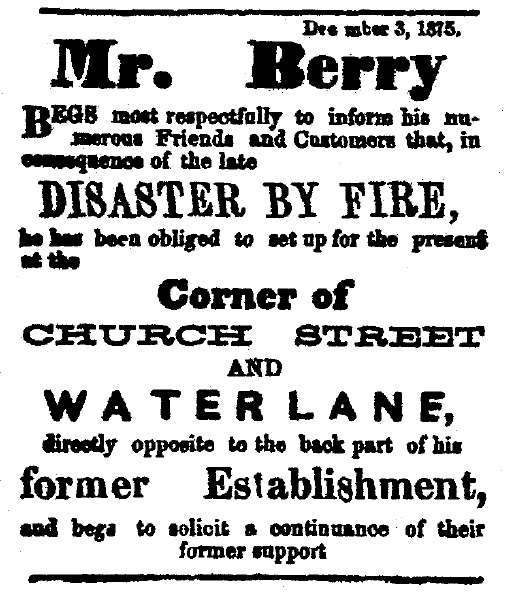 Nearly an hour had elapsed before water could be obtained in Harbour Street, and at this time the entire building of the Journal Office was being consumed by the devouring element, and Berry's Establishment was in eminent danger. On Tuesday night Kingston had an [extrem]ely narrow escape—had it not happened that the night was an exceptionally still one—the fire that consumed the three Stores in Harbour Street would have extended over a large portion of the town. As it was, the full blast of heat and flame went perpendicularly upwards, instead of being swept against the neighbouring [propert]ies and the burning sparks floating slowly through the air were comparatively cool before they fell on the surrounding housetops. Had there been a steady breeze to scatter [flames] and sparks around, nothing could have saved the tinder-box premises at the rear in Water Lane, and from thence the fire would have spread through the eastern and central portions of the town. Whether the destruction of a portion of this area would have been an unmixed disaster for the community in general is a question we are not called on to go into. However well it may be to gain comfort after such a misfortune from the consideration that many necessary improvements will result, it [ ] is a different matter calmly to discuss the advantages of benefits to be obtained at the price of severe individual loss and suffering. The chief benefit which we may congratulate ourselves on as likely to result from Tuesday's fire is the complete re-organization of the fire brigade which will, we presume, take place without delay.